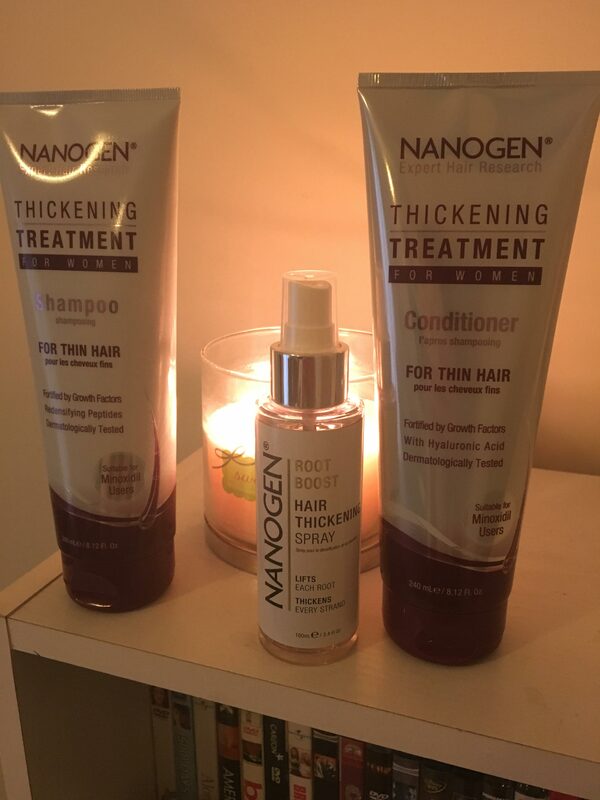 I’ve always had really thin hair, so I was really excited when I got sent some products from Nanogen to review. Anyone who also has thin hair will already know that it can be quite a bind. Not only is it really knotty – I used to cry when my mum or dad brushed it and my hairdressers are always terrified or hurting me – but second day hair is pretty much too greasy to leave the house without dry shampoo and it looks pretty pathetic in an up do or a ponytail. I was sent Nanogen’s Shampoo and Conditioner as well as their Hair Thickening Spray and I’ve been using it every wash for a couple of weeks now. Firstly: usability. So, with both the shampoo and conditioner, you have to leave it on for a little while in the shower to get the best results. I apply the shampoo, massaging it in for 30 seconds, and then wash my face with Dermalogica’s Microfoliant before rinsing off the shampoo. I then apply the conditioner and leave this on while I wash and shave. When applying the shampoo, you can tell straight away that it has thickening properties – it feels a lot thicker than a normal shampoo – but it still lathers up really nicely. The Hair Thickening Spray is then applied to wet hair after washing and is activated by a blow dry. I particularly love the spray, I apply it super liberally all over my roots and the lengths of my hair but it doesn’t make my hair greasy at all – thank goodness because I need all the help I can get on that score! Each of the products is enriched with peptides and anti-ageing hero ingredient hyaluronic acid which help to promote growth, volume and thickness while giving the hair a shine without making it look greasy. Although no one has mentioned anything about my hair appearing thicker, I think the results are quite noticeable for myself. My hair definitely looks quite a bit more luscious, especially when worn curvy or wavy – have a look at my pics from the #bloggersball to see what I mean. Thank you for such a wonderful article dear and from my side I want to say that i am using oconut & hibiscus hair care trio from long for my hairs and its really effective. SheaMoisture’s Coconut & Hibiscus Curl & Shine Shampoo is gentle, sulfate-free and enriched with natural ingredients like Coconut Oil and Hibiscus Flower Extract to restore natural moisture to your hair. Thank you for your positive review, it is very usefull for me, and also I would like to share that I’am 10 in 1 renewal system hair masque I have used this product for a number of years. My hair is in great condition. Cleanses fantastically! and leaves my hair in great shape.